Describes how types, statements, expressions, and declarations should be printed. This type is intended to be small and suitable for passing by value. It is very frequently copied. Definition at line 37 of file PrettyPrinter.h. Create a default printing policy for the specified language. Definition at line 39 of file PrettyPrinter.h. 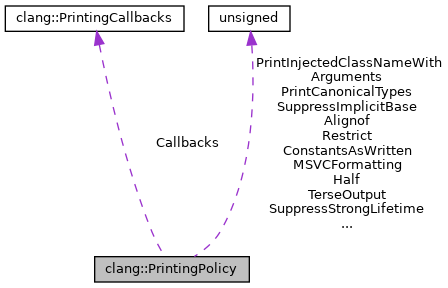 Adjust this printing policy for cases where it's known that we're printing C++ code (for instance, if AST dumping reaches a C++-only construct). This should not be used if a real LangOptions object is available. Definition at line 59 of file PrettyPrinter.h. Referenced by clang::DeclarationName::print(), and printCXXConstructorDestructorName(). Whether we can use 'alignof' rather than '__alignof'. Definition at line 165 of file PrettyPrinter.h. When printing an anonymous tag name, also print the location of that entity (e.g., "enum <anonymous at t.h:10:5>"). Otherwise, just prints "(anonymous)" for the name. Definition at line 145 of file PrettyPrinter.h. Whether we can use 'bool' rather than '_Bool' (even if the language doesn't actually have 'bool', because, e.g., it is defined as a macro). Definition at line 159 of file PrettyPrinter.h. Referenced by clang::BuiltinType::getName(), and clang::DeclSpec::getSpecifierName(). Whether we should print the sizes of constant array expressions as written in the sources. Definition at line 140 of file PrettyPrinter.h. Whether we should print the constant expressions as written in the sources. Definition at line 218 of file PrettyPrinter.h. Referenced by printExprAsWritten(), and PrintFloatingLiteral(). When true, print the fully qualified name of function declarations. This is the opposite of SuppressScope and thus overrules it. Definition at line 225 of file PrettyPrinter.h. When true, print the half-precision floating-point type as 'half' instead of '__fp16'. Definition at line 188 of file PrettyPrinter.h. When true, include newlines after statements like "break", etc. Definition at line 195 of file PrettyPrinter.h. When true, include the body of a tag definition. Definition at line 102 of file PrettyPrinter.h. Referenced by clang::getParameterABISpelling(), and clang::Decl::printGroup(). The number of spaces to use to indent each line. Definition at line 66 of file PrettyPrinter.h. Use whitespace and punctuation like MSVC does. In particular, this prints anonymous namespaces as `anonymous namespace' and does not insert spaces after template arguments. Definition at line 200 of file PrettyPrinter.h. For use in Microsoft mode when wchar_t is not available. Definition at line 192 of file PrettyPrinter.h. When true, do certain refinement needed for producing proper declaration tag; such as, do not print attributes attached to the declaration. Definition at line 184 of file PrettyPrinter.h. Whether to print types as written or canonically. Definition at line 231 of file PrettyPrinter.h. Whether to apply -fdebug-prefix-map to any file paths. Definition at line 228 of file PrettyPrinter.h. When RemapFilePaths is true, this function performs the action. Definition at line 234 of file PrettyPrinter.h. Whether we can use 'restrict' rather than '__restrict'. Definition at line 162 of file PrettyPrinter.h. When true, don't print the implicit 'self' or 'this' expressions. Definition at line 221 of file PrettyPrinter.h. Referenced by isImplicitSelf(), and isImplicitThis(). Suppress printing of variable initializers. SuppressInitializers will be true when printing "auto x", so that the internal initializer constructed for x will not be printed. Definition at line 122 of file PrettyPrinter.h. When true, suppress printing of lifetime qualifier in ARC. Definition at line 151 of file PrettyPrinter.h. Definition at line 105 of file PrettyPrinter.h. Referenced by clang::NestedNameSpecifier::print(), and clang::DeclarationNameInfo::printName(). Whether we should suppress printing of the actual specifiers for the given type or declaration. SuppressSpecifiers will be false when printing the declaration for "x", so that we will print "int *x"; it will be true when we print "y", so that we suppress printing the "const int" type specifier and instead only print the "*y". Definition at line 82 of file PrettyPrinter.h. Definition at line 148 of file PrettyPrinter.h. Referenced by clang::TemplateArgument::print(), and rewriteToObjCProperty(). Definition at line 92 of file PrettyPrinter.h. Definition at line 155 of file PrettyPrinter.h. Referenced by printCXXConstructorDestructorName(), and clang::index::printSymbolName(). Suppress printing parts of scope specifiers that don't need to be written, e.g., for inline or anonymous namespaces. Definition at line 109 of file PrettyPrinter.h. For example, in this mode we don't print function bodies, class members, declarations inside namespaces etc. Effectively, this should print only the requested declaration. Definition at line 179 of file PrettyPrinter.h. Whether we can use '_Alignof' rather than '__alignof'. Definition at line 168 of file PrettyPrinter.h. Whether we should use '(void)' rather than '()' for a function prototype with zero parameters. Definition at line 172 of file PrettyPrinter.h.